MEDALLION: Celadon color new jade hand carved medallion depicting the cross-section of a tree and symbolizing the family. ACCENTS: Smoky quartz pillows and smooth rock quartz crystal ellipses. 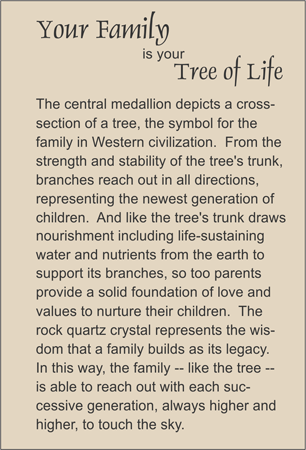 COMMENTS: Commemorate your family with this TRULYHUMANmedallion.